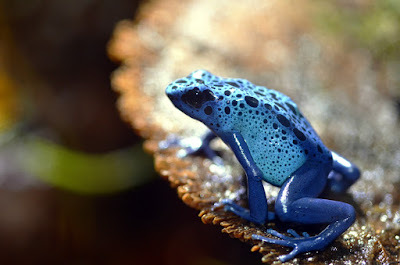 Hoppin' Happenings: Poison Dart Frogs! Animals have different ways of protecting themselves in the wild. Some are masters of camouflage, blending in with their surroundings until they are practically invisible. 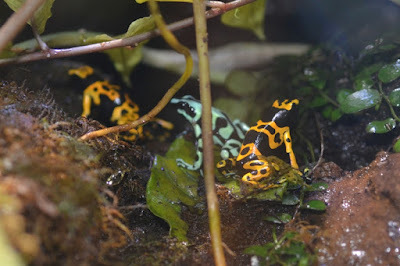 There are some animals, however, that advertise their presence with bright patterns or colors…just like our poison dart frogs! Located on the third floor of the Aquarium, our Poison Dart Frog exhibit has four different species of brightly-colored amphibians. Seen hopping around or sticking to the glass, the species showcased are found throughout the rain forests and humid lowlands of South America, including places like Brazil, French Guiana, Venezuela, and Colombia. 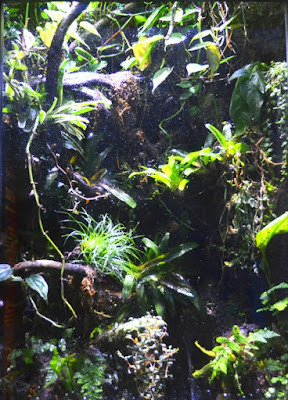 To make it seem like home, the exhibit has live plants, “rains” and has a constantly running water feature to keep it nice and humid. 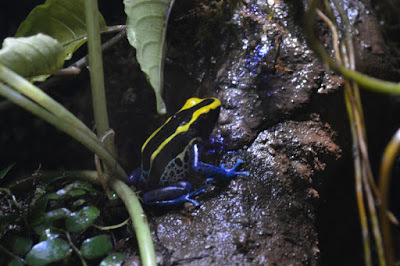 Among the green vegetation of the exhibit, it’s easy to pick out the vibrant yellow, cobalt blue, lime green and deep black patterns that these species wear so well. But why the bright colors? Animals that stand out from their environment are often warning other animals that messing with them will end in bad news! These brightly colored or patterned animals may be venomous (like lionfish), have a foul odor (like skunks) or be poisonous to eat. As you might guess by their common name, poison dart frogs have a toxin on their skin that makes them non-palatable to other animals. How many frogs do you see? So where does that toxin come from? The frogs don’t create their own toxin but rather gather it from the food that they eat. In the wild, the frogs would eat various insects that have the toxin. 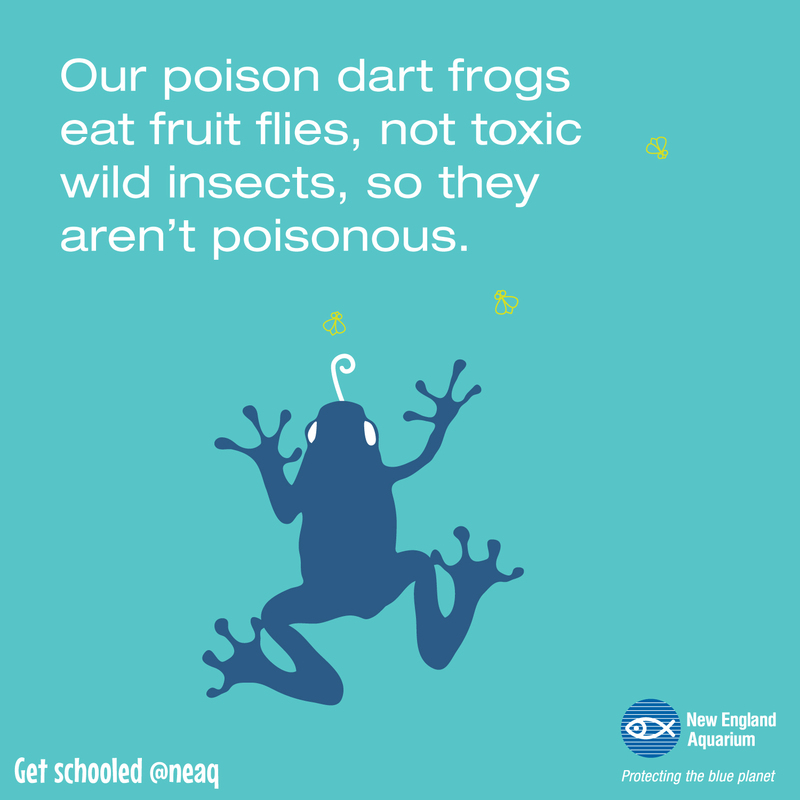 The more insects they eat, the more toxin the frogs bioaccumulate and transfer to their skin. And while the Aquarium’s frogs continue to have the same bright colors as their wild counterparts, the frogs here aren’t actually poisonous! Instead of insects they would eat in the wild, we grow fruit fries for the frogs to eat. 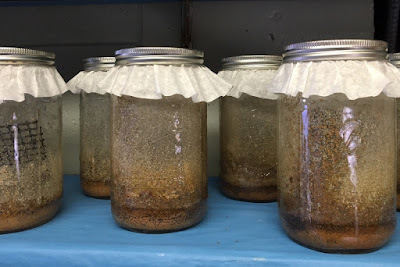 Yup, the same fruit flies that bother the overripe bananas you left on the kitchen counter. The flies have none of the toxin so thus the frogs can’t accumulate it. And thank goodness! Different species have different toxins of varying levels of potency, with many of the toxins causing such symptoms as general pain, cramping, partial paralysis, heart complications or even death!